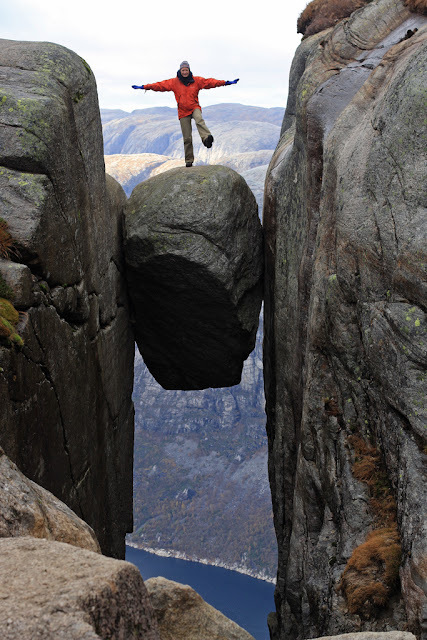 Would You Stand on The Kjeragbolten? Image Credit Flickr User Deeds! 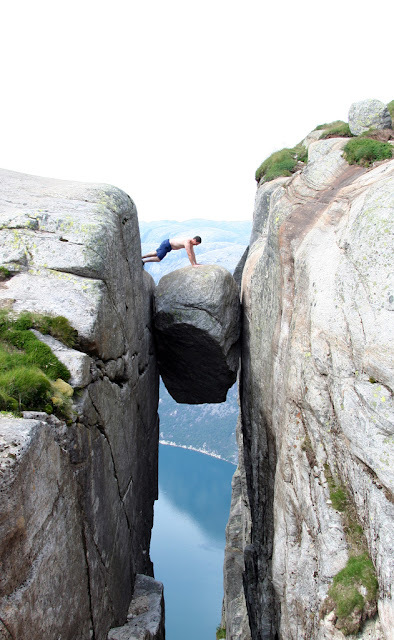 The name means the Kjerag Bolt – a massive 5 m³ boulder wedged in to a crevasse on the edge of the Kjerag mountain in Lysefjorden, Norway. 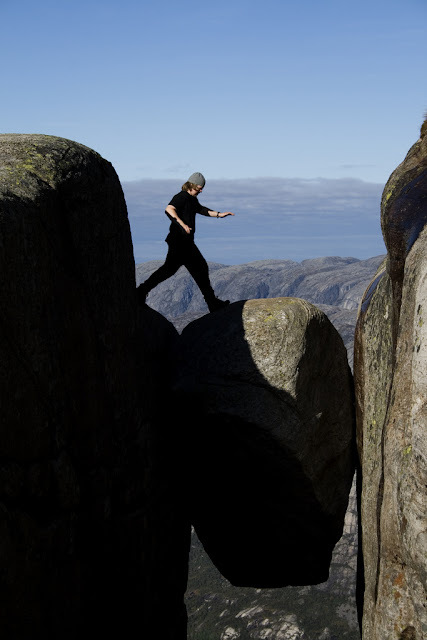 Without the help of any mountaineering equipment, brave visitors can walk on to the bolt – it is said to bring good luck. 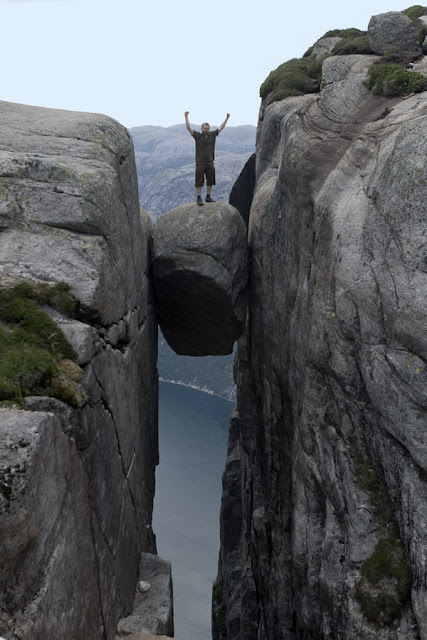 Yet there are consequences for those unsteady of foot: the nearest ledge is 241 meters below. 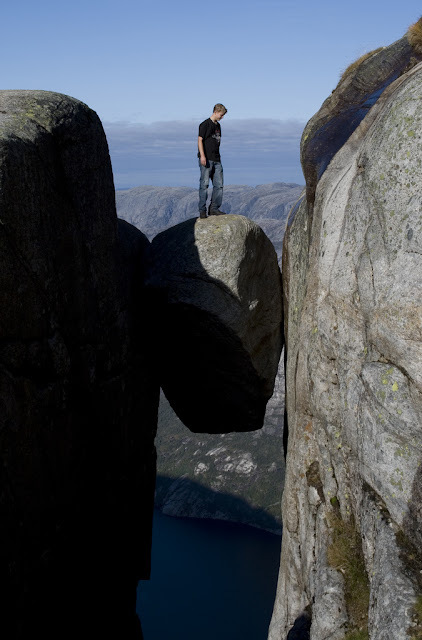 Once you bounce off that there is a drop of a further 735 meters. 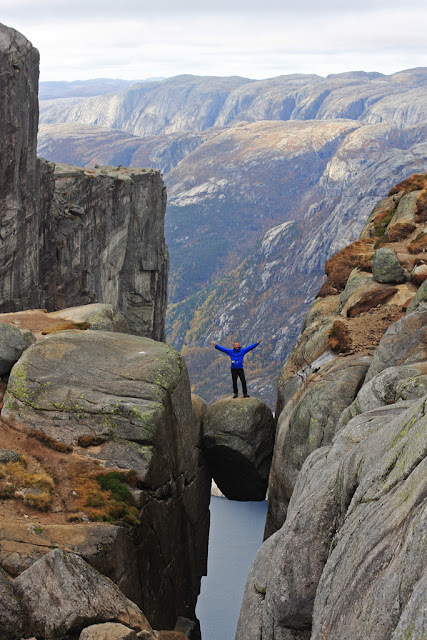 So, the question is, would you – like these mad fools brave souls – stand on the Kjeragbolten? 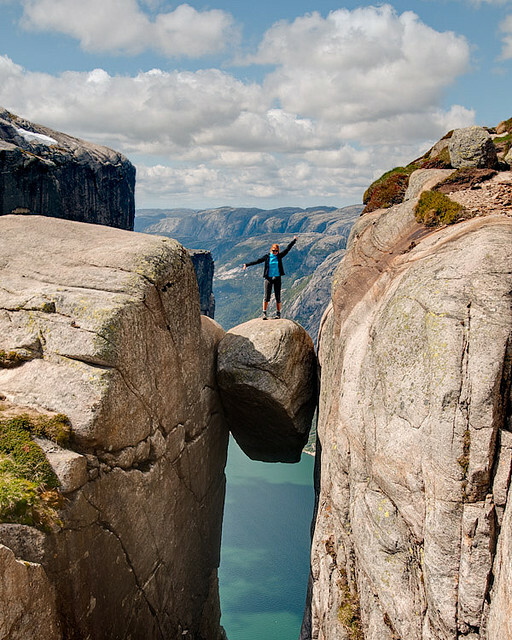 There is absolutely no Photoshop used here, so if you don’t like heights, look away now! 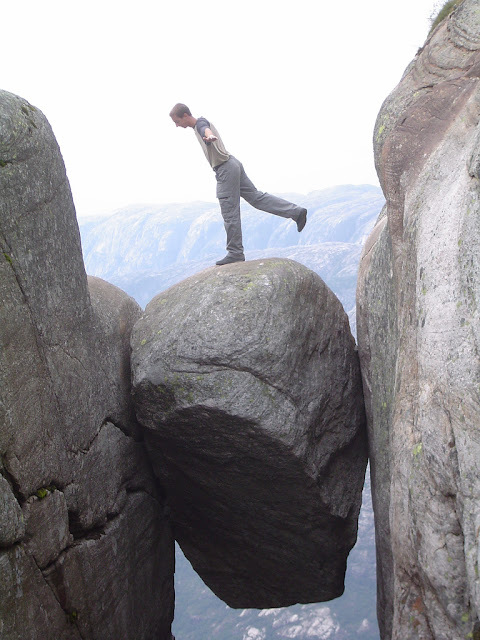 Kuriositas readers - did you stand on the Kjeragbolten? Answer = "YES, WE DID!" 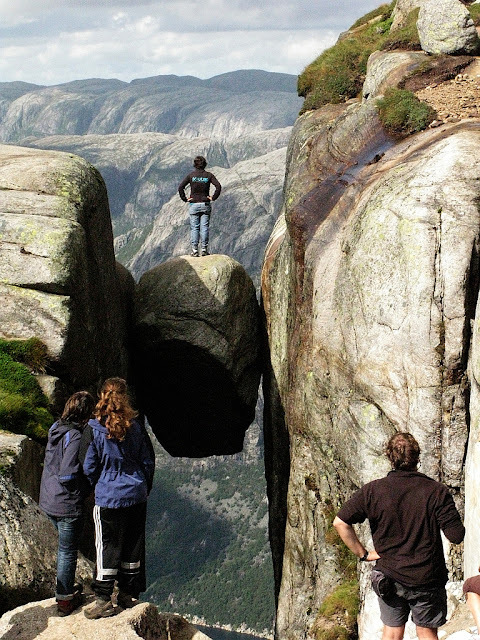 Thanks to Kuriositas reader Nammi Lakhani who was fearless enough to stand (and even jump!) 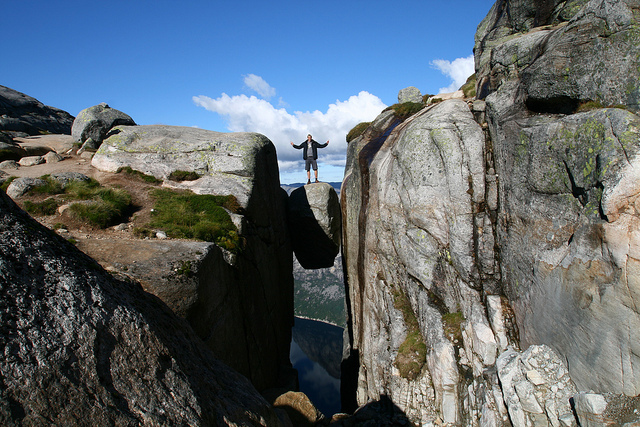 on the Kjeragbolten. If you have a picture you want to share with our readers please send it to us at taliesyn30@aol.com. Thanks! 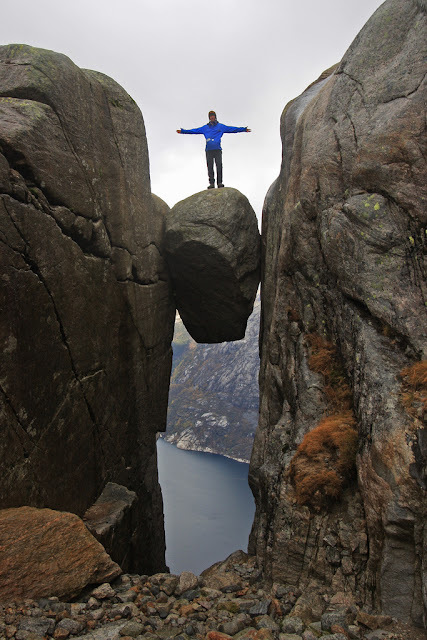 Sisters Aleksandra and Magdalena Wrzos from Poland have also visited this amazing place - that's Aleksandra in the picture. This is a treat. 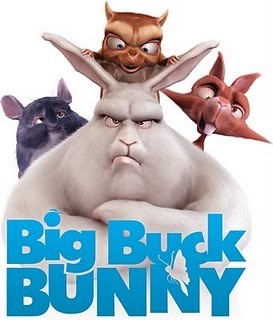 All is well in the world of the Big Buck Bunny, an oversized rabbit with a heart of gold. However, on his patch there is a trio of rodents (Frank, Rinky and Gamera) who are duty bound to cause as much trouble as they can and they proceed to terrorize the local animals without mercy. One day, however, they go to far and make an enemy out of Big Buck himself. The story of how Bug Buck gets his own back is wonderfully told with many knowing asides to animations of yesteryear if you know where to look. As a tale of vengeance, however, it is gentle - and this story is suitable for most age groups (especially if you like your toon humor of a level of sophistication between Tom and Jerry and Shrek. 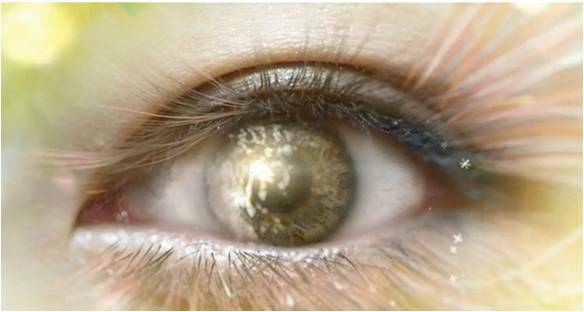 The movie is completely made using the Blender platform which is open source. Blender developers worked extensively to improve the software in accordance with the needs of the movie team. Improvements were made in hair and fur rendering, the particle system, UV mapping, shading, the render pipeline, constraints, and skinning. Also introduced during the project was approximate ambient occlusion. These features were released to the public with Blender v. 2.46. This is something quite special. The Big Catch Movie (which is in fact just a few minutes long) is one of the best animated short films I have seen in a long time. It tells a simple story but it tells it in a wonderfully comic way and with great humor too. A fisherman walks down a pier in his local town to go fishing. Unbeknowns to him his would-be nemesis lurks in the waters nearby. What happens next is a fantastic concoction of the accidental and the slapstick. For you animation buffs out there, the modelling and animation tasks were all done in Maya. The rendering was done using Renderman/Mental Ray and for the effects like the water dripping off the shark (a very good effect too, water is hard to do!) there were some specially made scripts by film maker Moles Merlo who lives in Paris. 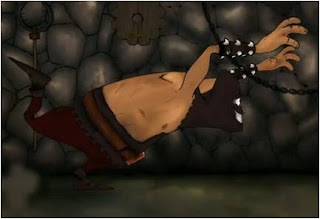 Shake was used for the compositing. Watch this one to the end - you will, I can almost guarantee - love this (and yes, it is more than suitable for children and work throughout). Back in medieval days you knew where you stood. If you landed in a prison then you knew what to expect from the resident torturer – and the resident torturer knew exactly what to do with you. Unfortunately, when your newest prisoner is a witch then the normal rules may not apply, especially when her original captor forgot to relieve her of her wand! 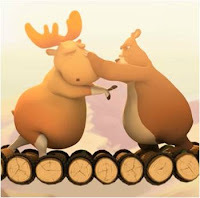 This is René Hoekstra’s graduate project at at the Utrecht School of the Arts where he was responsible for the animation of this very funny short. It is very much in the ‘old school’ as it were. In fact it reminded me, oddly enough of Tom and Jerry shorts, despite the absence of cat and mouse! Some of the sound effects seem familiar,too! The music is supplied by Bart Delissen with sound design by Hessel van Hoorn. 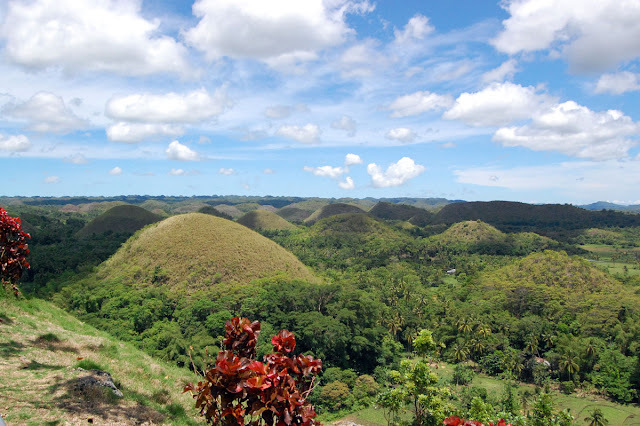 Bohol in the Philippines is home to a dramatically unusual geographic feature – the Chocolate Hills. A shame, but a certain Mr Wonka has not been visiting (and neither is this the entrance to the fabled land of the Oompa Loompas). In the summer the lush green grass that covers the hills turns brown and it is this, rather than any fictional intercession which gives the place its name. No one has (strangely) ever counted the exact amount of these haycock hills. 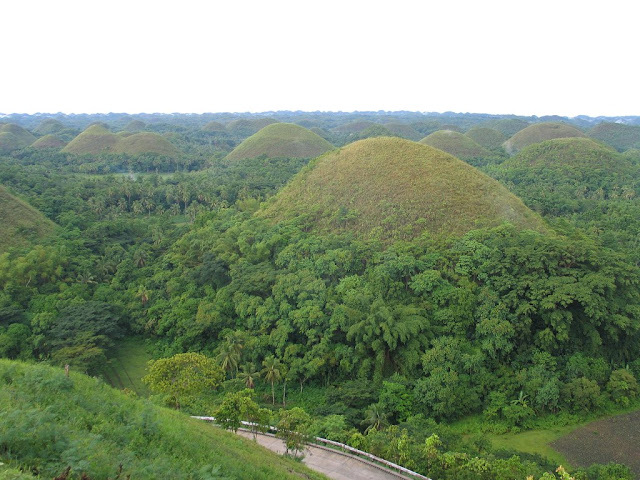 However, it is thought that there are up to 1800 of them dotted around the central area of the island of Bohol. 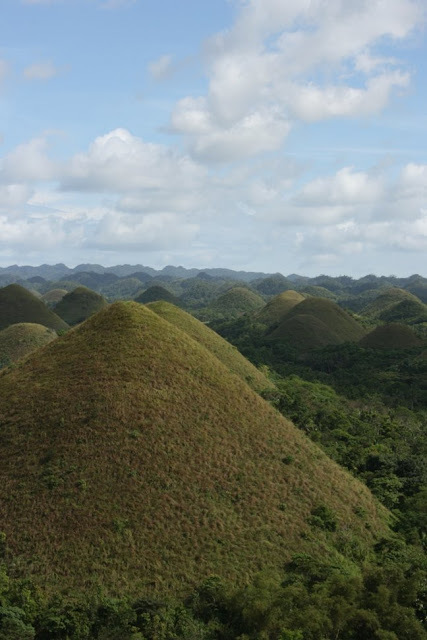 Yet, what gives the hills their conical (or at least dome like) shape? Could they perhaps be man-made ancient burial chambers? 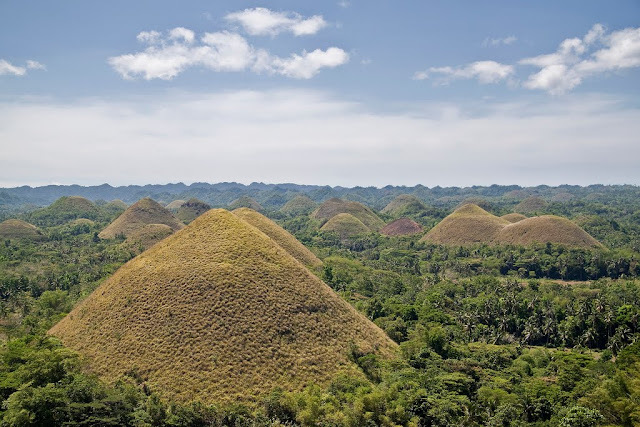 Although there are, unsurprisingly, many myths which surround these almost symmetrical hills, they are the product of natural processes rather than anything mankind has produced. 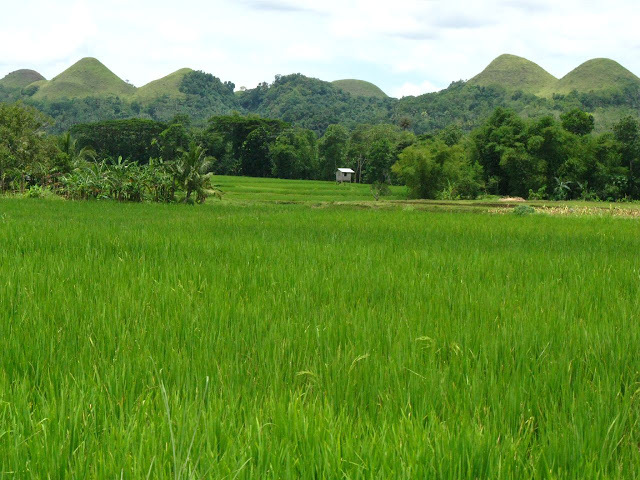 The hills are made of limestone which has then been covered with topsoil on which grass then has grown. They are not simply bumps in the ground either. 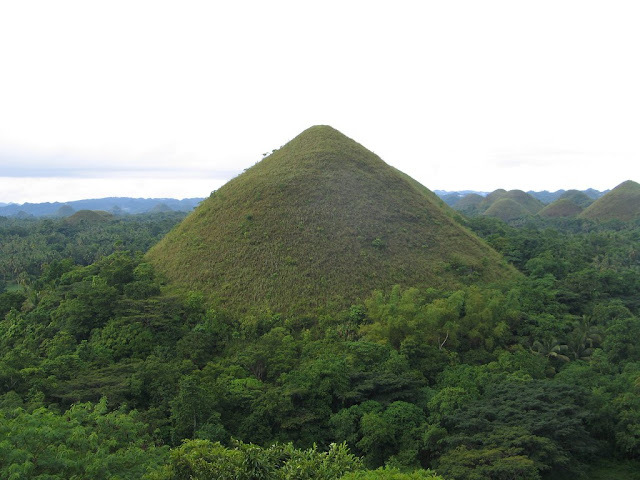 The largest one rises almost 400 feet in height above the plane of Bohol although generally they tend to be between 100 and 160 feet in height. 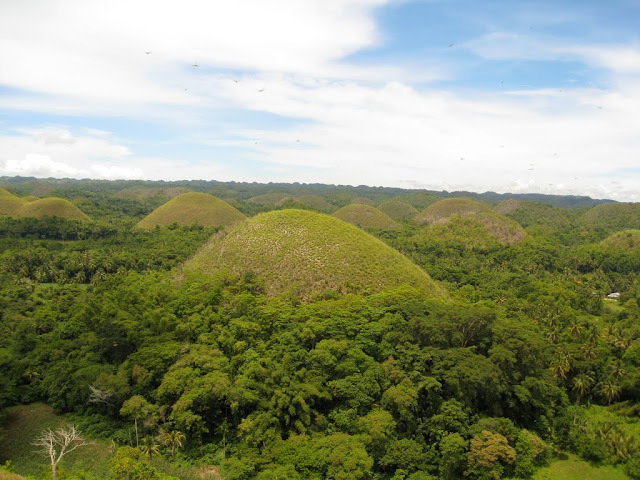 Their height and their sheer number has meant that they have been the primary source of income through tourism for the nearby town of Carmen. In the dry season where there is virtually no rain the hardy grass on the hills dries up (but does not die) and the hills get their chocolate color. It is said that the hills get their name from the Hershey confection known as Chocolate Kisses (above) but this sounds something of a chicken and egg situation, in truth. 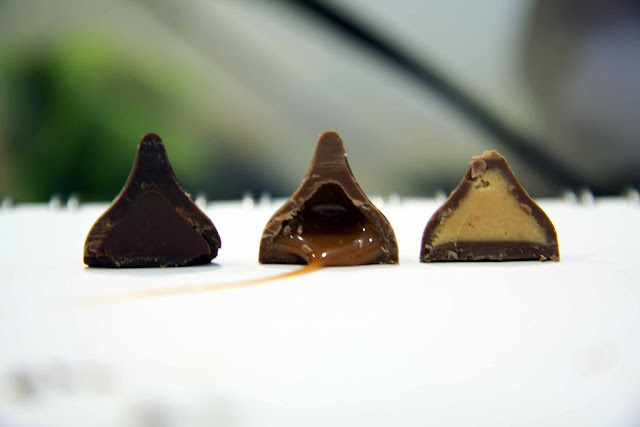 Although the Hershey treat has been around since 1907 the hills have been here a lot longer. 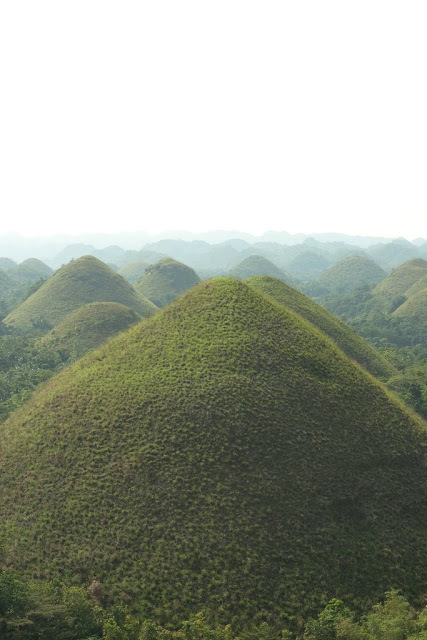 The limestone of the hills is actually called karst. This topography is caused when layers of bedrock made up of a soluble substance such as dolomite or in this case limestone. The landscape has been slowly eroded through a process called solvation. The hills are that which is left behind. 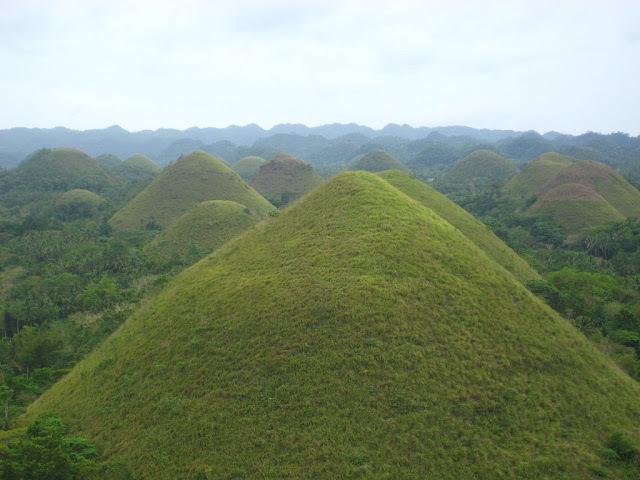 You can visit some other pages which feature karst formations at the bottom of this article. 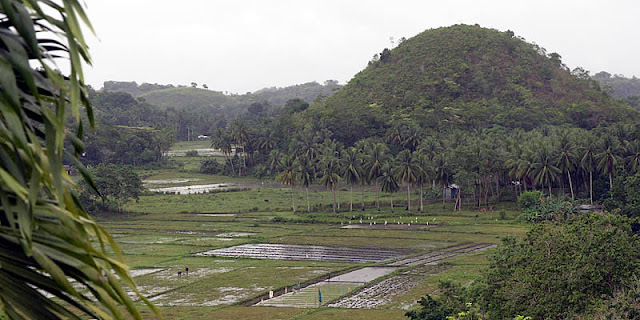 The shape of the hills, known as a geomorphologic structure, is known as a mogote. 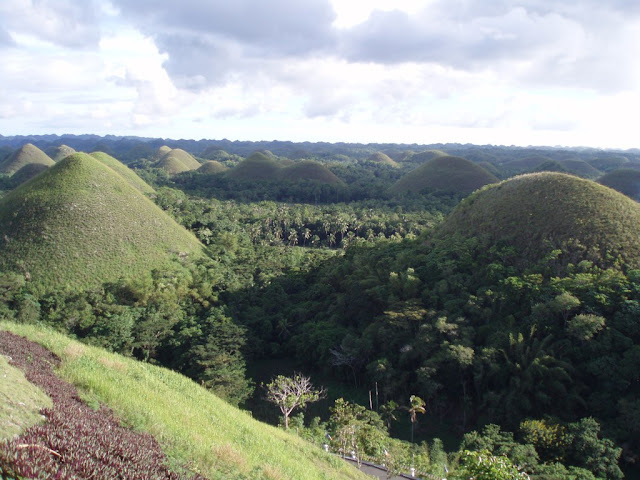 Although they have been formed through the solvation of their limestone by thousands of years of rain there is another factor in Bohol. 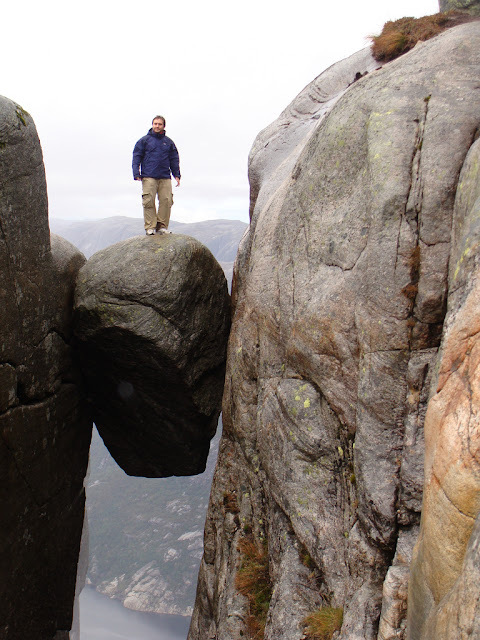 There is a great deal of erosion by rivers after they had been uplifted above sea level. 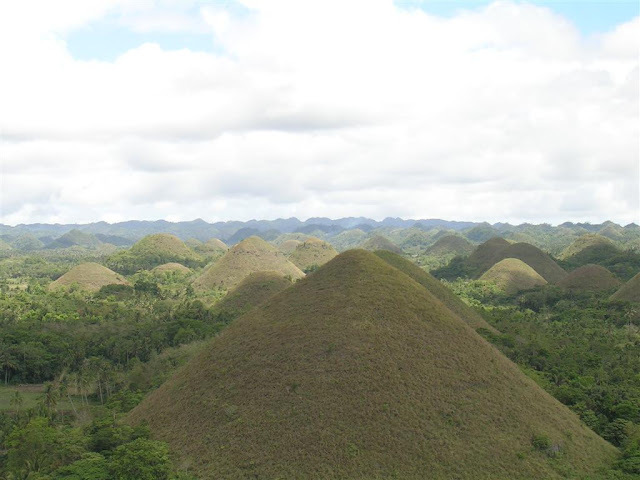 The farmland that separates the hills is full of rivers and caves with underground springs and these have contributed to the unique shape of the Chocolate Hills. 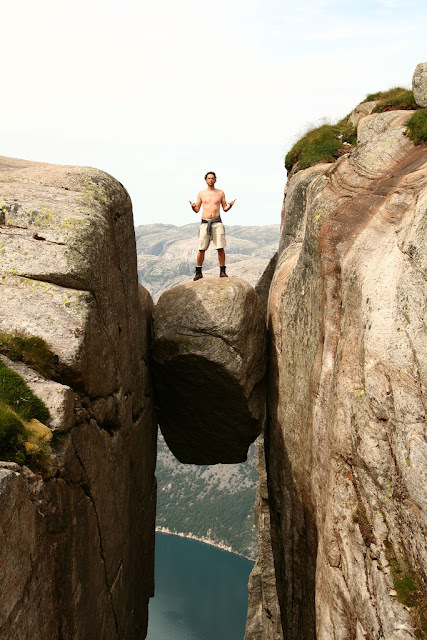 As with any unusual geographical feature, local legends abound as to how they got there in the first place. One story involves a pair of giants who fell out with each other. 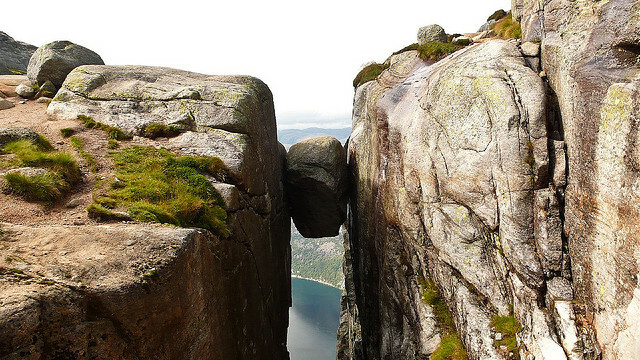 They fought by hurling huge rocks at each other until they were exhausted. Once they awoke they forgot their differences and departed but didn’t bother to do any cleaning up. If you are more of a romantic you may prefer the legend of Arogo and Aloya. Like our friends above, Arogo was a giant but Aloya was mortal and she had a much shorter lifespan. 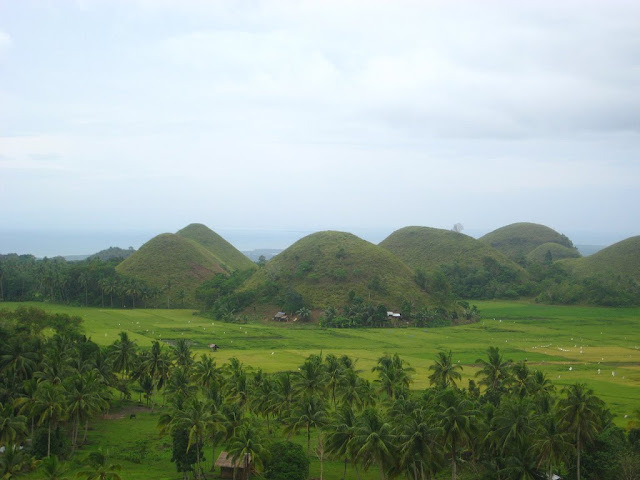 When Aloya threw off her mortal coil, Arogo was so bereft that he shed giant tears which formed the Chocolate Hills where they landed. Several other legends are also notable for their insistence that the hills were formed by the bodily functions of either a giant who was desperate to slim down or a giant moose with a stomach upset. 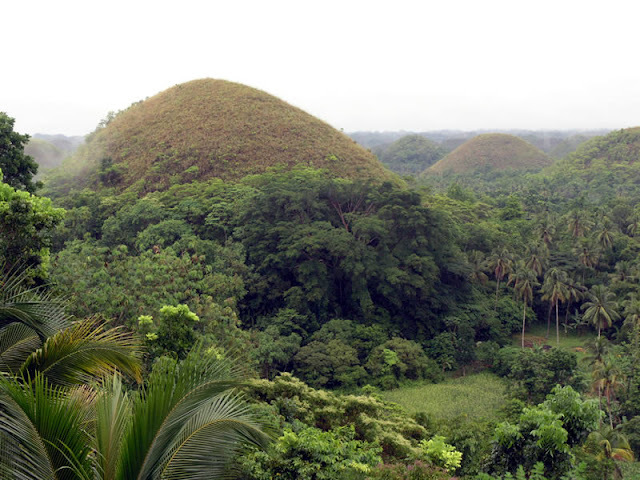 Both of these stories, had they gained preference, would have meant the Chocolate Hills could have ended up with an entirely different name – and not one entirely suited to family vacations. The hills were declared a national geographical monument in 1988 but mining was still levelling a number of the hills as recently as 2006. 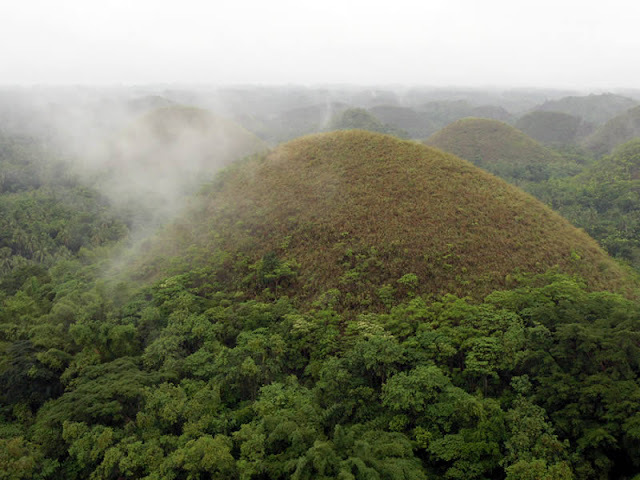 Even though UNESCO World Heritage status has been applied for the Chocolate Hills are still perceived as viable sites for small scale quarries by many locals. The greatest challenge for the future will be to balance the needs of local people with the obvious requirement that the hills are preserved for future generations to enjoy. 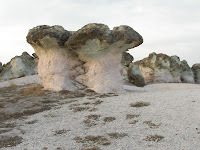 Local legend has it that the giant stone mushrooms of Beli Plast are in fact the severed heads of four sisters, who after fleeing an oppressor were pursued. He beheaded them as punishment for daring to run and here they remain to this day. In the early nineteen forties the city of Los Angeles was growing quickly. The Second World War was in full flow and when it came to the environment it was felt that some things could be neglected. The LA Department of Water and Power began diverting the lakes streams three hundred and fifty miles to the south. The damage to the environment would be untold. 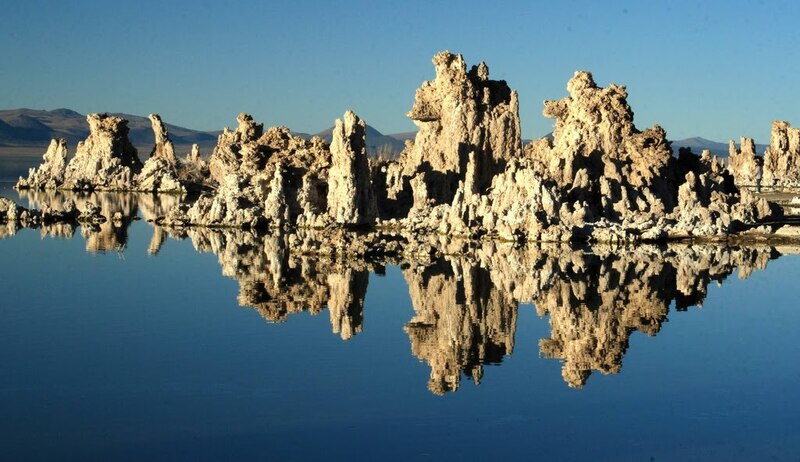 Paradoxically it would leave the area eerily beautiful – like some alien backdrop from an episode of Star Trek. Do you have a boring job? I will guarantee (almost) that it is not as boring as Marvin’s. He is on a long haul cargo flight and is bored, bored, bored. His estimated time of arrival is over two years but all is not as it seems! This is a very cool animation by production house Junkworks – plus if you are a fan of a certain science fiction franchise there is a real belly laugh for you by the end! 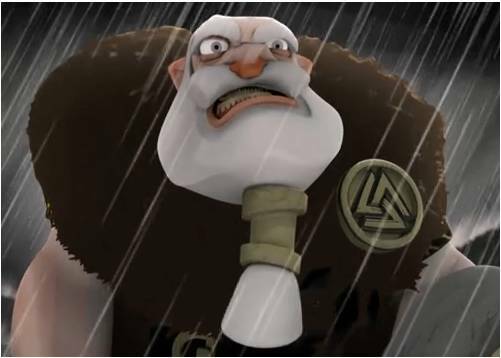 ETA was originally premiered at BreakPoint 2008 in Bingen, Germany where it won the 1st prize in the animation competition – not surprisingly. Life illuminates itself and then it begins to illuminates a new life. A sprouted mass of innumerable lights become a flow before long, and then become the part of the life-throb of ages. That ties life, this moment now. Bridge is a story about four animal characters trying to cross a bridge, but ending up as obstacles to one another in the process. The moral behind this story revolves around how there are often disagreements or competing paths in life, and the possible results of pride, obstinacy, and compromise. It was created by Ting Chian Tey. When this was first unleashed on the internet many people thought that Ting worked for Pixar (which I guess is an understandable mistake). However, he did not (though they should definitely offer a job!). He has, however, recently been working at Sony on Arthur Christmas so it looks like the competition may have nabbed him! Boxing Day always meant Norsemen for me! The main reason was because in my youth there were only three TV stations in the UK and the biggest, BBC1 always used to insist on putting The Vikings on their airwaves the day after Christmas. Now, this isn’t Kirk Douglas, Tony Curtis et al, but it is a Viking tale nevertheless and one of our Boxing Day treats for you at Kuriositas. Biorn is an old Viking warrior who, to get to Valhalla, must die in battle. Unfortunately every conflict he enter seems to end with the quick dispatch of his opponent. Until, one day a convent is attacked by a giant troll! This is immense fun, brought to you by the combined talent of The Animated Workshop. Does Biorn succeed and get to Valhalla? Watch and see! 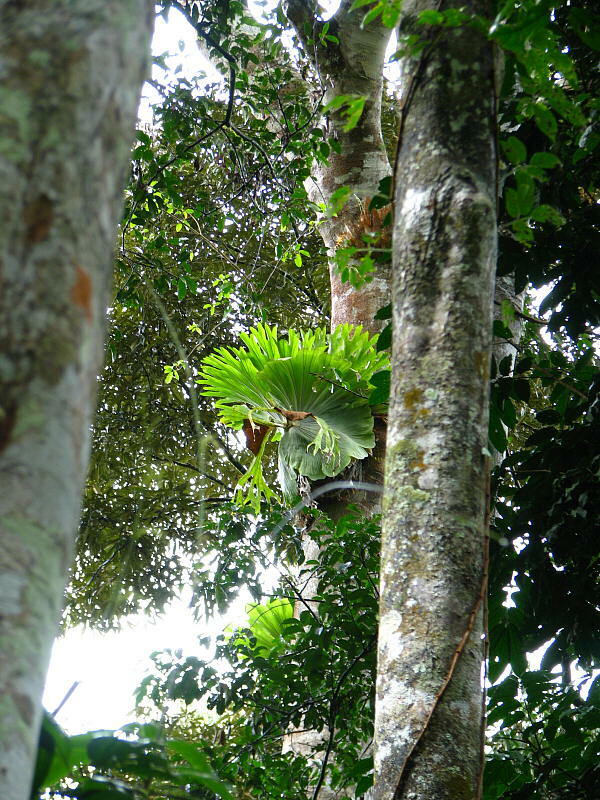 Platycerium – even the name sounds odd. 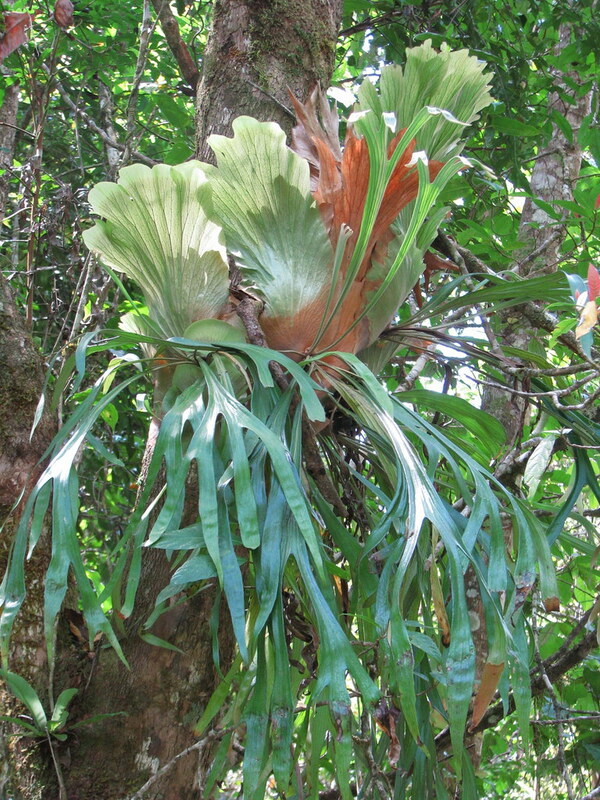 Mostly referred to as Staghorn or Elkhorn ferns, this genus of fern is, to say the very least, unusual looking. Yet they are fascinating to look at because their fronds are something else, quite unique. 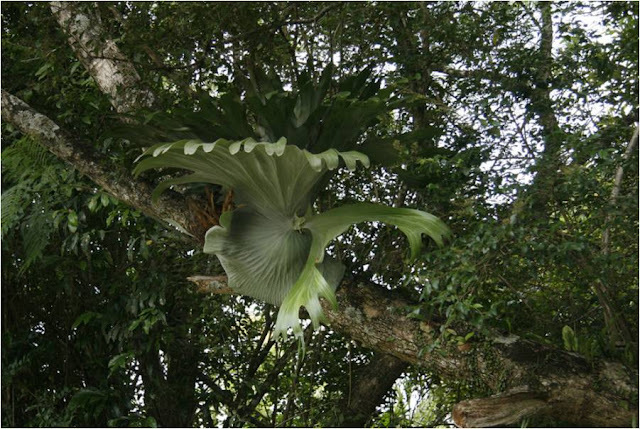 To look at a platycerium is to look back in time millions of years. 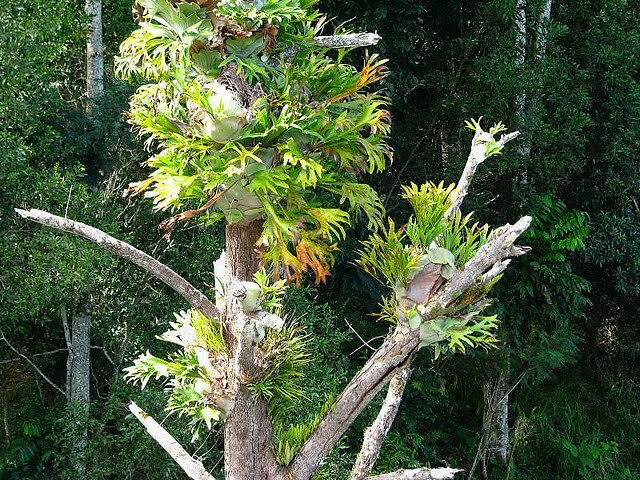 They are found on several continents, South America, Africa, Asia as well as Australasia and unsurprisingly thrive in tropical and temperate climates. They really aren’t your average fern at all. In their adult phase they are known as sporophytes and like all other members of the fern family they produce spores to produce the next generation. See the brown color on the fronds? Those are the spore patches. They produce a short rhizome (or root stalk) and this is the point from which the plant grows its fronds. However, it has a trick up its sleeve here. The first type of fronds it produces are known as fertile fronds and these will create the spores to prolong the species. 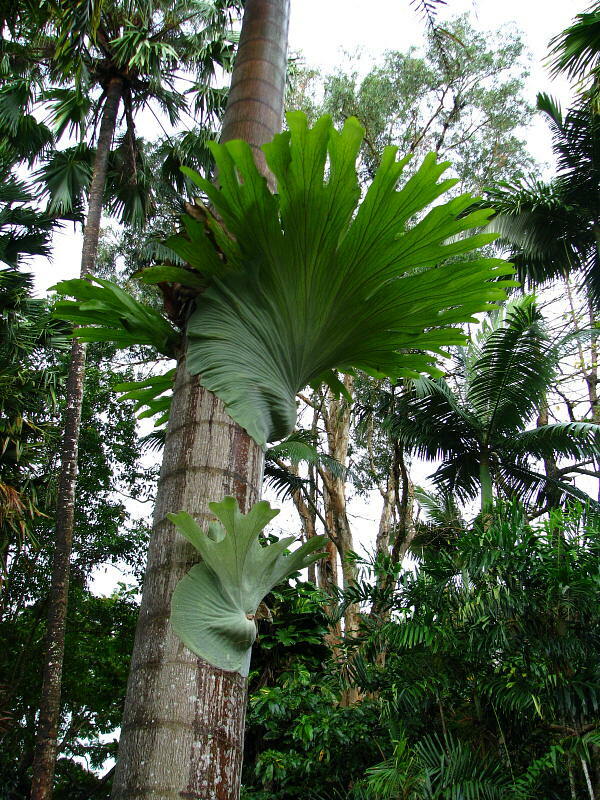 The platycerium, however, has a second type of frond, known as the basal frond. This is infertile but has a very important function. 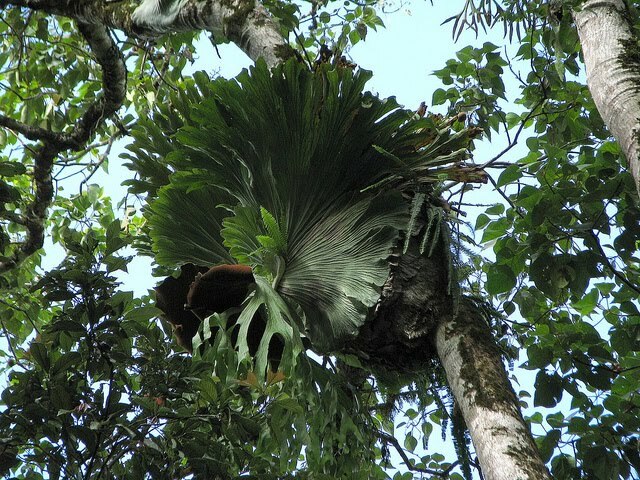 These shield shaped frond effectively laminate the plant against a tree, meaning that the platycerium can gain vertical height in the canopy. Of course, some end up quite close to the ground too! 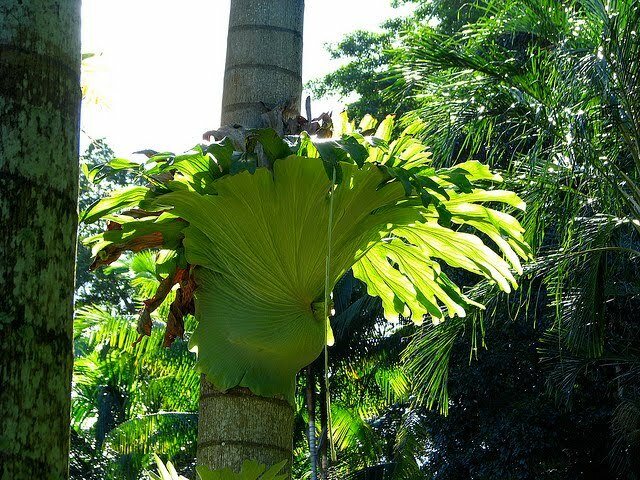 The basal fronds are also used to protect the tufted roots of the plant from harm and from becoming too dry. 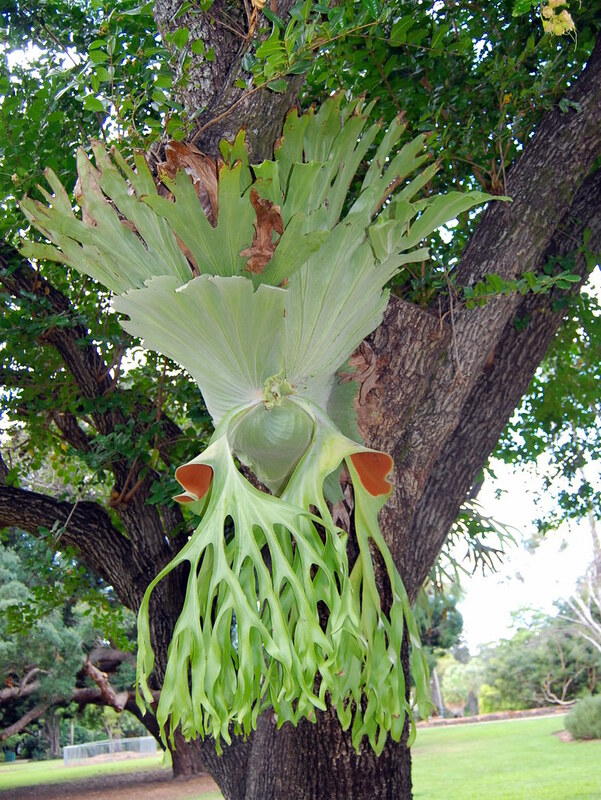 Some species of platycerium have fertile fronds which produce lobes in the shape of a crown. These catch water and other forest detritus. Mostly, though, they are shaped like antlers, which gives the plants their common names. Each front contains sporangia – these are where the spores are born and they are arranged on the lobes of the fronds. These particular spores are often called sporangiospores which admittedly does sound like an Italian pasta meal but without them there would be no next generation of platycerium. 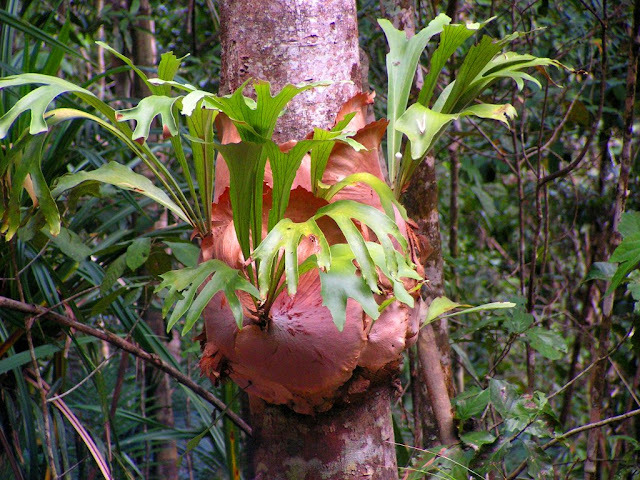 Platycerium can form colonies but some species have a single rootstalk. 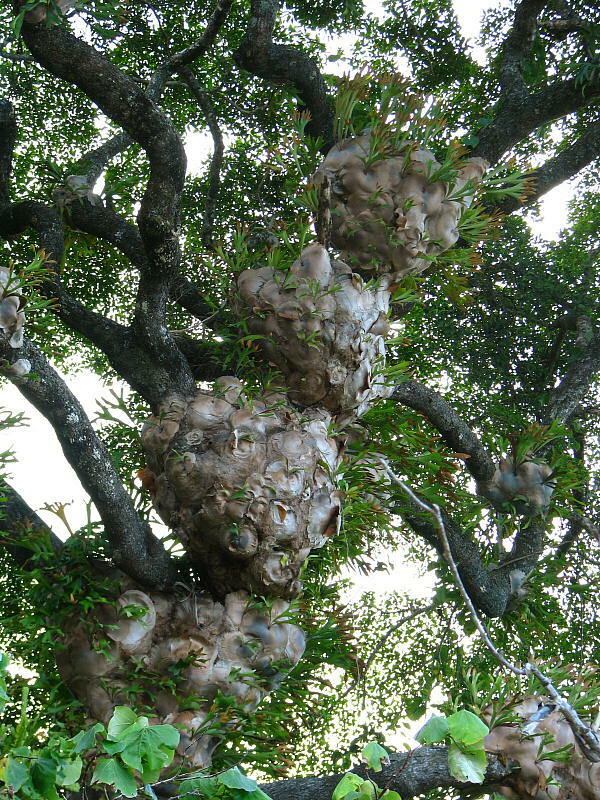 Colonies are created when a single rhizome (rootstalk) forms a branch. When the spores are released then hopefully they will alight on neighboring trees and start the process of growth again there. 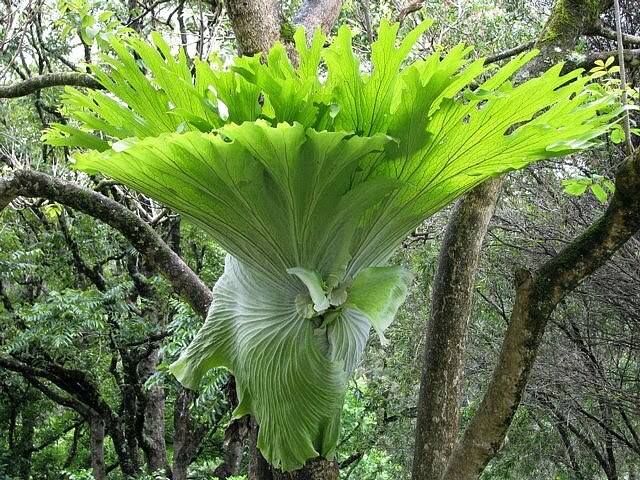 Many gardeners are enthusiastic about platycerium and the advantage of the colonial types of this gorgeous fern is that they can be propagated through a process of division. Once they are divided then some keen gardeners will strap the new plant (using stockings!) 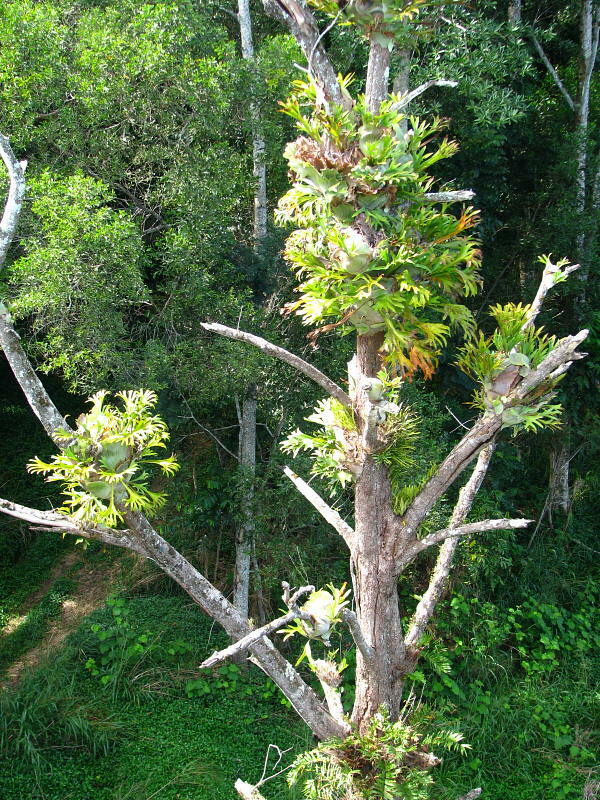 to a tree until a new rhizome is strong enough to support the plant’s weight on its own. They are an obvious talking point for a garden but are even more spectacular in the wild. When mature they are large – often more than a meter in width. 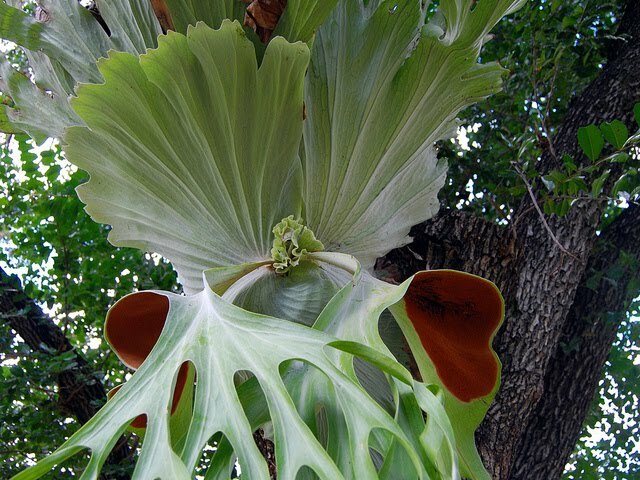 You might be forgiven for thinking that platycerium are parasitic but you would be wrong. 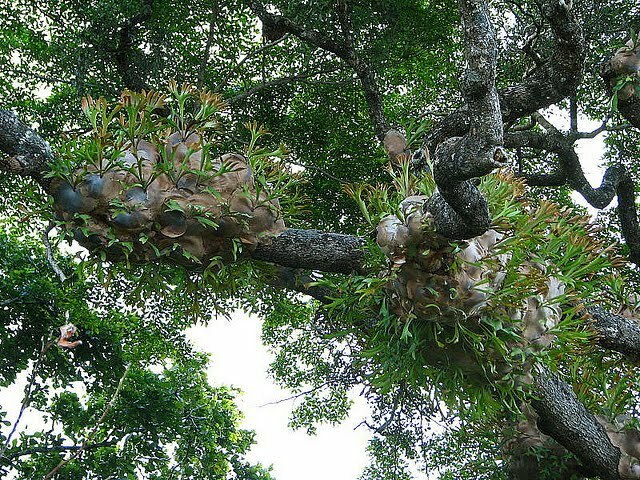 In a similar way to orchids, they grow on the host plant but do not take sustenance from it. They generate their own food and so do not need to draw food from their ‘host’ tree. Kuriositas would like to thanks Flickr Users tanetahi, Danya R, Jiggs Images, Bellingen1, Poytr and dracophylla for their very kind permission to use their wonderful photographs. Please visit their photostreams and discover their pictures!